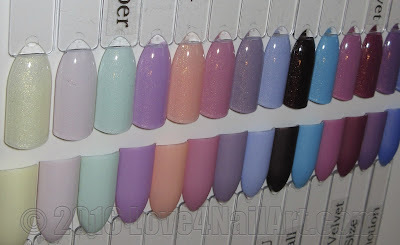 This is part 2 of the Kylie Jenner Trends Matter Collection Velvety Demi Mattes. 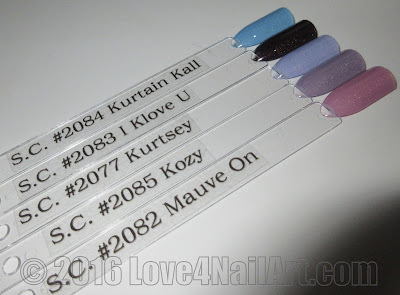 In this post I will review the next 5 shades of the collection. SinfulColors website describes this color as "Kuddle up to this lavender grey and gold shade". To me this is a semi-sheer grey toned purple. Gorgeous & cool toned. Unique to my collection as I do not own a color similar to it. SinfulColors website describe this color as "bow down to this polite pastel blue hue". This is another one of the semi-sheer polishes. While it is a beautiful cool toned pastel blue with the slightest hint of purple, something for me was lost in the application of this color. 3 coats would be necessary for my level of opacity in which I seek. SinfulColors website describes this color as "fall deeply in love with this dark maroon and gold shade". This polish appears as a rich brown color in the bottle. BUT... surprise, when you apply this polish you see a deep and beautiful merlot color. It is opaque and very rich. A great dark vampy color as an alternative to black. It has subtle shimmer in it that you lose in the application unless you add a SHINY topcoat. SinfulColors website describes this color as "ready for your kloseup? Step out in style with this aqua and gold shade". This shimmer shade applies quite streaky at first, but continues to level out nicely. I don't think this color is necessarily aqua, to me it appears as a medium sky blue polish.